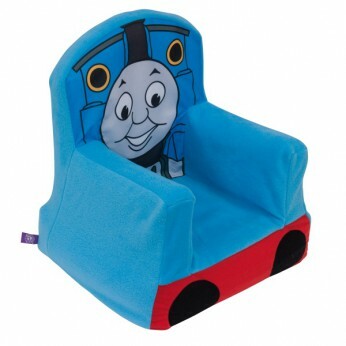 All aboard with Thomas and Friends with this cosy Thomas chair. A perfect seating solution for your little engine driver. With an inflatable inner, it has a soft fabric cover which is machine washable, so spills aren’t a problem as it can be kept clean and fresh. It’s easily inflated and deflated too. Dimensions : 45L x 52W x 50H cm…. Thomas the Tank fans will love this Thomas Cosy Chair! Featuring an inflatable liner and a soft fabric cover which is removable and machine washable, so spills aren?t a problem. Its perfect for the bedroom or playroom and features a Thomas design. This toy costs approximately £16.99 (for the latest and best prices make sure you check our retailer list for the Thomas Cosy Chair above). In our review of Thomas Cosy Chair we classed it as being suitable for ages 3 years, 4 years, 5 years but recommend you check the manufacturer specific advice before purchasing.